As some of you like to think and brand me as a super woman who easily balances home, work, kid and food blog, I hate to burst that thought bubble. But here is the fact… I am far from being a super woman. I am just a normal woman who has limitations and faults and from time to time I demonstrate these qualities. There comes a time in my life where I don’t feel like cooking. Although it happens very rarely, it does happen for sure. It usually happens when I am tired of thinking and asking my better half what he wants to eat for dinner and he comes back with the great reply ‘whatever you want’!!! Just what I wanted to hear! Brilliant!!! That’s when I officially close the kitchen for a day or two or even for one entire week and binge on takeaway food or frozen food and sigh looking at all the delicious delicacies posted in various food blogs! But with Lil dumpling in tow, I don’t have a heart to stay away from kitchen for more than two days! So for the days like these where I have very little heart to cook, the simple and easy recipes come to my rescue. Most of the times it is simple Rosematta Ganji/Kanji/Congee with quick stir fried vegetables (Palya as we call in Kannada), dollop of ghee, pinch of salt and my favourite tender mango pickles. Sometimes I come up with some crazy and easy peasy Soup recipes that I serve with garlic baguette or simple buttered toast. And there are times when thinly sliced vegetables are stuffed in between two breads with a slice of cheese and grilled to golden perfection that satisfies our appetite. But then comes a time when none of the above works and all we need is some delicious carbs loaded potato curry to go with store bought frozen parathas or chapatti. And that’s when I cook this delicious Dhariwala from Mallika Badrinath’s 100 Vegetarian Gravies cookbook. 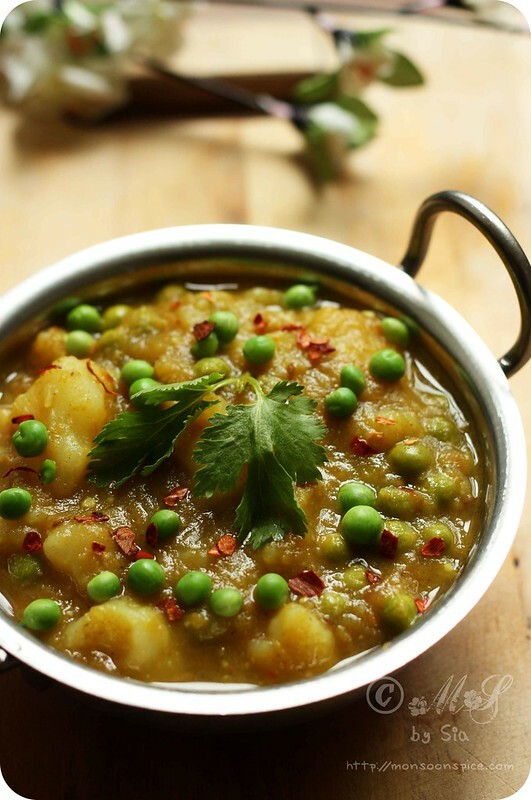 The chunky potato and green peas cooked in simple but delicious onion-coriander-tomato gravy is one of the best tasting Potato and Peas Curries I have come across. The secret of taste in this Dhariwala lies in the fact that ‘less is more’! Just a handful of everyday ingredients and under spiced than most of Indian curries, this recipe for Dhariwala has always come to my rescue when I don’t want to compromise on taste department. Most of the hard work is done by the pressure cooker which cooks the potato and green peas to perfection. And another big task is done by your humble mixer grinder or food processor where you literally dump half the ingredients. All you are required to do is tadka/temper, fry the onion-coriander paste, cook the tomato puree and mix in the cooked potato and green peas and let it simmer. 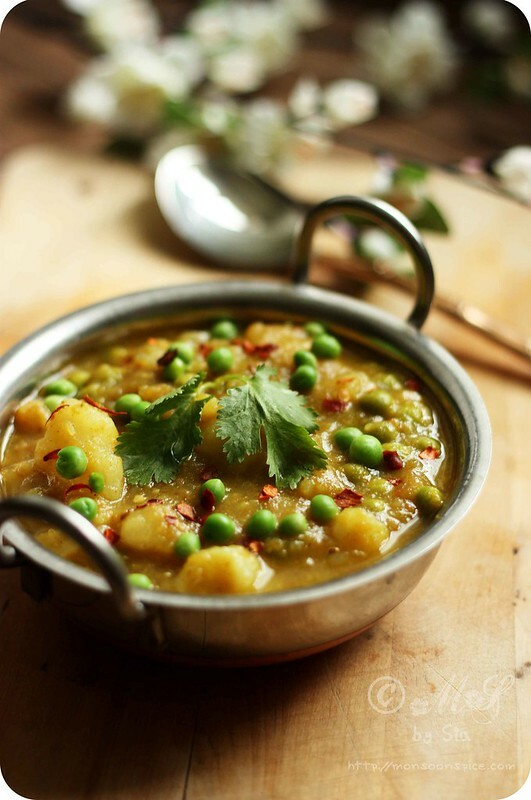 For all this ‘hard work’, you will be rewarded with one of the best tasting Potato and Peas Curry that always leaves one wanting for the second, and many times, third serving! Don’t believe me? 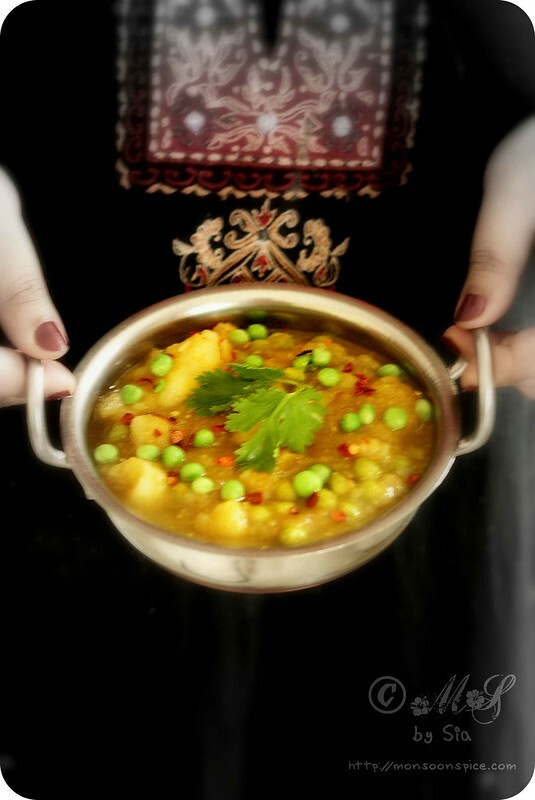 Then it’s time for you to cook and taste this delicious Dhariwala, one of the best tasting Potato and Peas Curry. 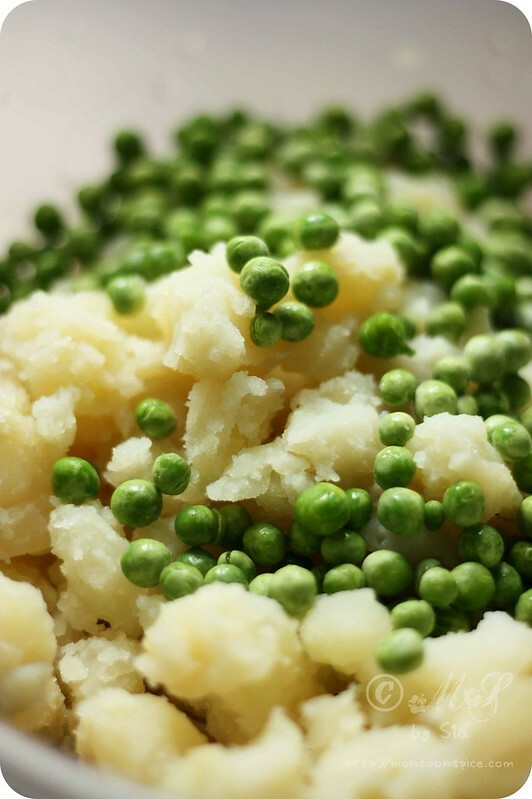 Boil the potatoes along with fresh green peas, Peel the potatoes and roughly mash them, make sure that there are some chunks of potatoes left. Cooking them in pressure cooker speeds up the process. While the potatoes and green peas are cooking, prepare the onion-coriander paste and tomato puree that will be used for the gravy. Grind all the ingredients listed under onion-coriander leaves paste to smooth paste without adding any water. For tomato puree, book suggests you to place them in a pot of boiling water for 3-5 minutes and then peel the skin before grinding them to smooth puree. I skipped cooking and peeling the skin of tomatoes, as I don’t see much difference in taste, and simply pureed them without adding any water. Heat oil in a pan and add cumin seeds and hing to it. When cumin seeds start to sizzle and change colour, add ground onion-coriander leaves paste and cook for 5-7 mins till the oil starts to leave on the sides and raw smell of the paste disappears. Next, mix in the pureed tomatoes and give it a good stir. Let it cook for 2-3 mins. Add cooked and mashed potatoes and green peas and mix them well. Add salt to taste and about 1½ to 2 cups of water and mix them all well. Let the curry cook for 8-10 mins on medium flame for all the flavours to blend well. Switch off the flame and garnish with some finely chopped coriander leaves. 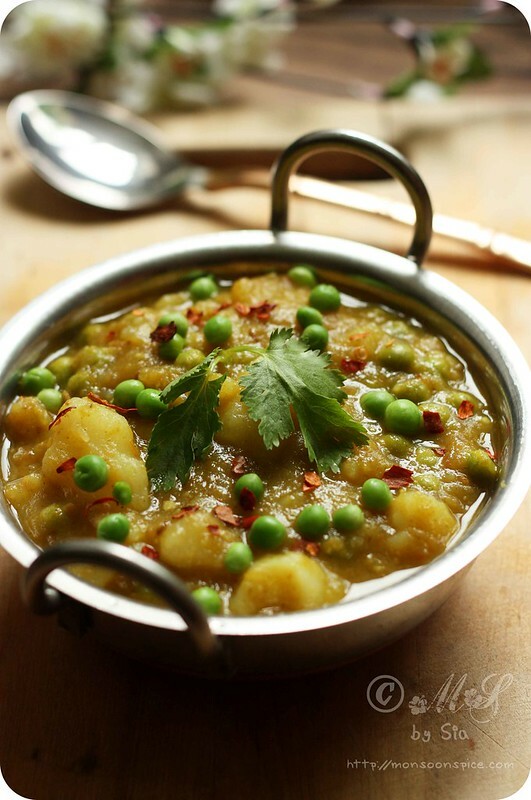 Serve this delicious Dhariwala, a simple Potato and Peas Curry, with any Indian flat breads (Whole Wheat Naan or Butter Naan or with any stuffed parathas) or plain/flavoured Basmati rice. It tastes good with Dosa and Poori too! Dhariwala ~ A bowl of carb goodness! You can drizzle a tbsp or two of freshly squeezed lime/lemon juice for little tangy note. Dhariwala can also be made by substituting whole green gram and leafy vegetables in place of potatoes and green peas. 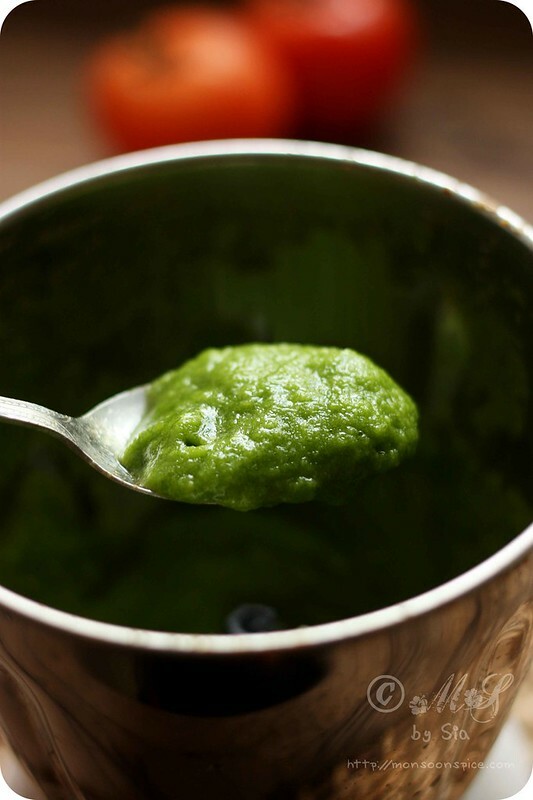 Soak green grams for 6-8 hours before cooking with leafy vegetables. 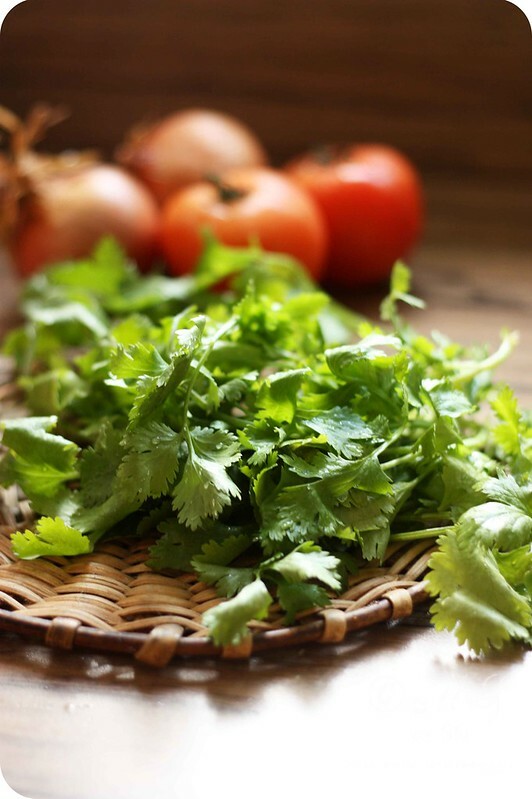 And oh, omit coriander leaves if using fresh green leafy vegetables. 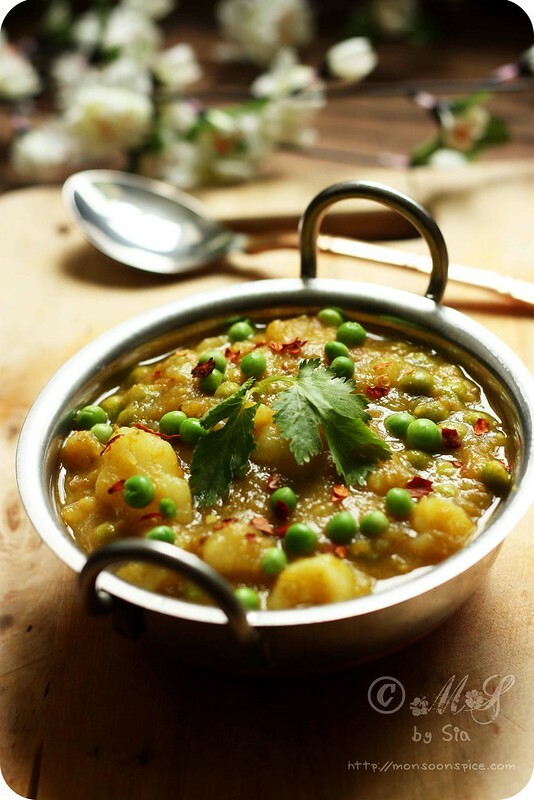 If using frozen green peas, you need not pressure cook them with potatoes, simply add them to the gravy along with cooked potatoes and let them simmer. and yes even though i love to cook, there are ocassions when i don't want to cook and i just make some masala rice or quick sabzis. this is exactly i feel about this dish sia... :) if iam lazy but want to have something great... i like d idea of including dhaniya in the onion paste.. will try it next time i pick aloo matar.. This recipe sounds like a must try Sia. I make phulka rotis at home so this curry would be great. 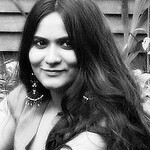 I have quite a few books of Mallika and I am sure I have this one too. Glad that you tried this and blogged it. I have lurked on your blog for a while after searching for a recipe for Aloo tikki and stayed because of your lovely recipes . I had to laugh when I read the observation about not wanting to cook and asking your husband what he wanted. I have been with my hubby for 22 years, have a daughter at university and a young son and when I ask that question I always obtain a useless reply as well. I am sure that they are trying to be helpful but it does have the exact opposite effect. Iam looking forward to cooking this curry and the cashew nut curry previous to this one. With kind regards and a fervent hope for more wonderful recipes from your kitchen. This is so comforting and looks delicious too, coriander onion paste is new to me, have to try this out soon.. Tried this yesterday for dinner. Tasted awesome. Thank you so much. I stopped by your blog when I was searching for Nan Khatai. Your Saffron Nan Khatai is a Hands down favorite here. Thanks again for your lovely recipes. Beautiful snaps and brilliant composition. That Dhariwala looks tempting! I just came across your blog and its amazing! I'm now a happy follower:-)I hope you have a chance to stop by mine. My husband reacts the same way.. it seriously makes me mad! Abhi, the type of onion used shouldn't make much difference. Only thing I can think of that makes the curry taste bitter is if you have not fried the onion paste until the raw smell/taste disappears. You need to fry the onion paste for at least 7-9 mins. You can also add a tsp or two of sugar when frying the onion paste as it helps to caramelise the onion. I hope this helps.